„Tokugawa-shitennô“ (徳川四天王), lit. „Four Heavenly Kings of the Tokugawa“, is a summarizing nickname for four of Ieyasu’s best generals. The term itself alludes to the Four Heavenly Kings (shitennô, 四天王) of Buddhist iconography. In the following, I want to introduce the Tokugawa-shitennô one after another and introduce some of their favourite swords or swords of which we know that they were in their possession. Let´s start with the eldest of the four, Sakai Tadatsugu. Tadatsugu war born in the seventh year of Daiei (大永, 1527) as second son of the Matsudaira-retainer Sakai Tadachika (酒井忠親) in Ida Castle (井田城) in Mikawa province. After coming of age, he served first Tokugawa Ieyasus´s father Matsudaira Hirotada (松平広忠, 1526-1549), the then lord of Okazaki Castle (岡崎城) of Mikawa province. By the way, Tadatsugu was 15 years older than Ieyasu. The latter spent his childhood as so-called „human pledge“ and was raised within the Imagawa family (今川). When he broke with the Imagawa in Eiroku three (永禄, 1560), Tadatsugu changed to the service of Ieyasu and was four years later made lord of Yoshida Castle (吉田城) which was located in Mikawa too. He made himself a naw in the battles of Anegawa (姉川の戦い) in Genki one (元亀, 1570), of Mikatagahara (三方ヶ原の戦い) in Genki three (1572), of Nagashino (長篠の戦い) in Tenshô three (天正, 1575), and of Komaki and Nagakute (小牧・長久手の戦い) in Tenshô twelve (1584). In Tenshô 16 (1588) he handed over the leadership of the family to his son Ietsugu (酒井家次, 1564-1618) and withdrew to his mansion in the Sakurai district (桜井) in Kyôto where he got a pension of 1.000 koku. He died there on the 28th day of the tenth month Keichô one (慶長, 1596) at the age of 70. When Oda Nobunaga conquered in Tenshô ten (1582) the provinces of Shinano and Kai and quasi eliminate the Takeda clan (武田), he stopped on his way back at Yoshida to thank Sakai Tadatsugu for his service. He presented him 200 ryô in gold and this highly elegant and magnificent tachi of Bizen Sanemitsu which came in an itomaki-tachi-koshirae. The blade has a nagasa of 76,9 cm, a sori of 2,7 cm, is in shinogi-zukuri, has an iori-mune, a deep koshizori, funbari and an ikubi-kissaki. The kitae is a very densely forged ko-itame with ji-nie, and the hamon is a chôji mixed with gunome with a wide nioiguchi and which is a bit more flamboyant on the ura side. The tang is ubu and bears the niji-mei „Sanemitsu“. It is said the itomaki-tachi-koshirae dates to the time of Nobunaga. It shows a kin-nashiji lacquer saya and the fittings are en suite shakudô with nanako ground and show the takabori-iroe ornamentation of the 3-5-3 kiri crest. Tadatsugu got this tachi from Ieyasu for his military achievements in the Battle of Komaki and Nagakute. It also comes in an itomaki-tachi-koshirae with a kin-nashiji lacquer saya and en suite fittings with the aoi and kiri crest made by the Shônai-kinkô Yûrakusai Sekibun (遊洛斎赤文), that means the mounting dates to the Edo period. The blade has a nagasa of 76,6 cm, a sori of 2,4 cm and a motohaba of 2,7 cm. It is in shinogi-zukuri, has an iori-mune, a deep koshizori, funbari and a ko-kissaki, and so its sugata dates it clearly to the early Kamakura period. The kitae is a somewhat standing-out ko-itame mixed with ko-mokume. There is ji-nie and a faint midare-utsuri and the hamon is a quite nie-loaden mix of ko-chôji and ko-midare with nijûba and kinsuji whereat the yakihaba gets wider towards the tip. The bôshi is a wide yakitsume with hakikake and appears almost as ichimai. The tang is ubu, has a kijimomo-gata, shallow katte-sagari yasurime, a shallow kurijiri and bears the sanji-mei „Nobufusa saku“ (信房作). It is interesting that there were two more swords of Nobufusa in the possession of the Sakai family. The one is a rather small tachi with the sanji-mei „Nobufusa saku“ which belonged to the Sakai branch which ruled from the mid Edo period onwards the Himeji fief (姫路藩) of Harima province. And the other one was a tachi signed in the very same way which belonged to the Sakai branch which ruled the Obama fief (小浜藩) of Wakasa province. I have introduced this katana, the so-called „Inoshishigiri“ (猪切), some months ago in this article. According to transmission, Tadatsugu killed with this yari an opponent whi was hiding behind a large water jug (mizukame, 水瓶・水甕), namely by piercing (tôshi, 通し) the entire jug and the person behind. This earned the blade the nickname „Kametôshi“. It is said that it was a hira-sankaku-yari of Heianjô Yoshifusa (平安城吉房) with a nagasa of 21,2 cm but the whereabouts of the famous piece are unknown. But the yari must had been quite famous as there were several utsushimono made in the Edo period which all mention the provenance in the signature, namely in the way: „Mo Sakai Saemon no Jô Kametôshi-yari“ (模酒井左衛門尉瓶通槍), „made modelled on (mo, 模) the Kametôshi-yari of Sakai Saemon no Jô.“ Some of these copies are still in the possession of the Sakai family. This tachi was in the possession of the Shônai-Sakai family since the Edo period. It has a nagasa of 70,9 cm, a sori of 2,1 cm and a motohaba of 2,9 cm. The blade is also featured in my latest publication Kantei Supplement 2. With the extant signature at the very end of the tang, we can calculate an original nagasa of about 83 cm. 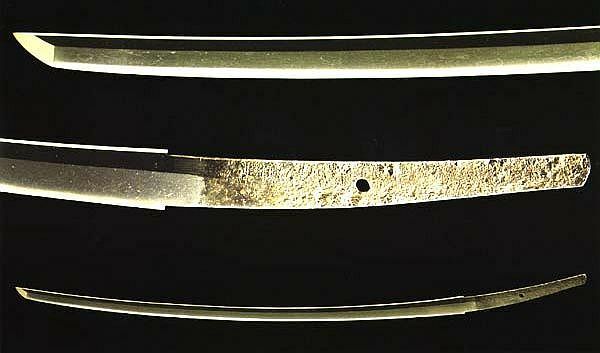 The kitae is a dense and beautifully forged itame with nagare towards the ha. Especially the haki-omote side shows many areas of a very densely forged hada. In addition, there is plentiful of ji-nie and chikei. The hamon is a rather low and slightly undulating notare-chō to suguha with hotsure, uchinoke, kuichigaiba, nijūba, yubashiri, sunagashi and kinsuji. The nioiguchi is wide, bright, clear and very nie-loaden, and the yakiba gets somewhat wider in the monouchi area. The bôshi shows much hakikake, tends to kaen, and runs out as yakitsume. 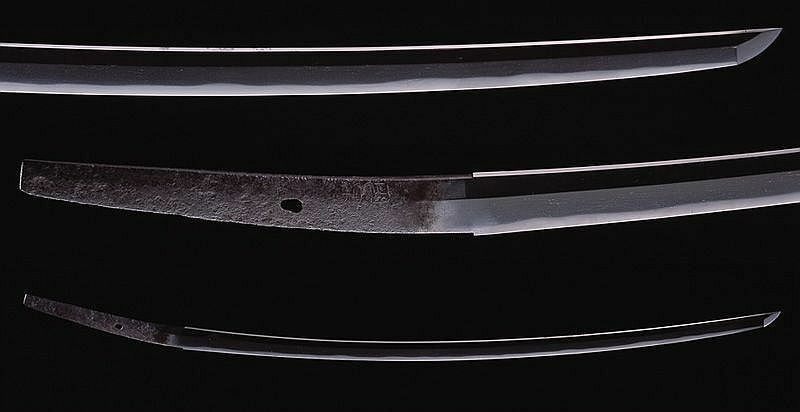 Incidentally, the futasuji-hi are untypical for Kanenaga but the accompanying documents to the blade show us that they were once added in Kansei eight (寛政, 1796) by the Hon´ami family, namely on orders of the Sakai family. Tadakatsu was born in Tenbun 17 (天文, 1548) as oldest son of Honda Tadataka (本多忠高) in Kuramae (蔵前) in Mikawa province. He served Ieyasu since his youth and participated in his first battle at the age of twelve (or 13 according to the Japanese way of counting years), namely in Eiroku three (永禄, 1560) on the occasion of an initiating fighting to the Battle of Okehazama (桶狭間の戦い). He took his very first head at the age of 15, namely those of the Imagawa-general Ohara Bizen (小原備前). 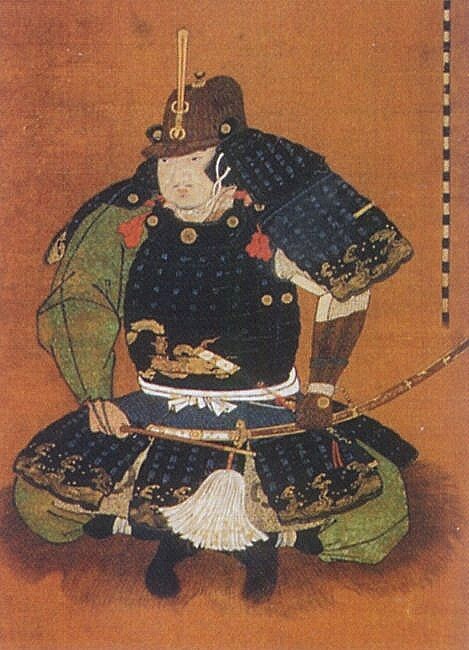 Later he participated in numerous battles, among others those of Anegawa, of Hitokotosaka (一言坂の戦い) in Genki three (元亀, 1572), of Mikatagahara, of Nagashino, and of Komaki and Nagakute. After Sekigahara, which he fought of course at the side of the Tokugawa, he received the Kuwana fief (桑名藩) of Ise province which had an income of 100.000 koku. He handed over the control of the fief to his son Tadamasa (忠政, 1575-1631) in Keichô 14 (慶長, 1609) and retirned, but died shortly later, namely on the 18th day of the tenth month of the following year at the age of 63. According to transmission, Tadakatsu´s son Honda Mino no Kami Tadamasa participated once in a falcon hunt when he decided to take a break at the house of a local man. This house had a special room marked with gohei streamers where a special sword was worshiped. Tadamasa asked the owner about the sword and he said that each family that had preserved that sword so far was free of vices and sins. He was eventually allowed to inspect the blade hands on and after some negotiations, he bought it from the man for an unknown sum. As the blade was ô-suriage and thus mumei, Tadamasa had it appraised by Hon´ami Kôtoku (本阿弥光徳) who attributed it to the famous master Gô Yoshihiro (郷義弘). And the appraisal was inlayed in gold on the tang via the kinzôgan-mei „Yoshihiro Hon´a + kaô“ (義弘本阿) and on the ura side „Honda Mino no Kami shoji“ (本多美濃守所持, „in the possession of Honda Mino no Kami“). Henceforth the nickname of the sword was „Kuwana-Gô“ as Tadamasa was the lord of Kuwana fief. By the way, (江) is another, shorter way to note Yoshihiro´s name „Gô“ (郷). 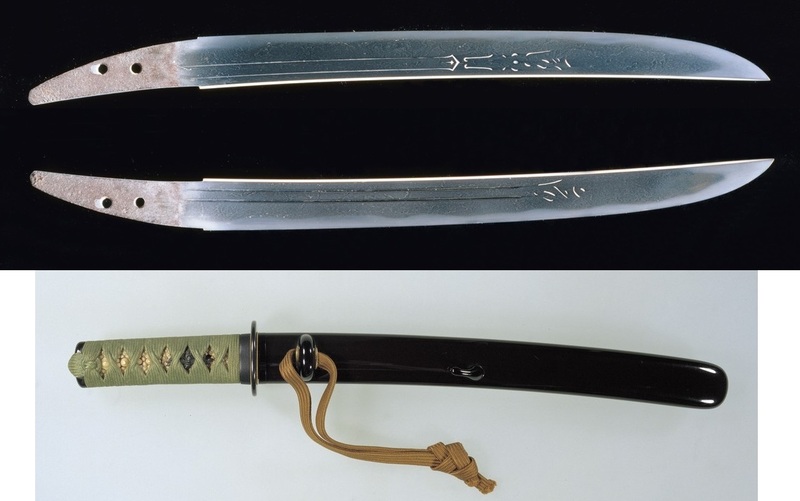 The blade has a nagasa of 69,4 cm, a sori of 2,0 cm, is in shinogi-zukuri, has an iori-mune, and a normal mihaba and kasane. The kitae is a ko-itame with plentiful of ji-nie and magnificent chikei which tends a little to masame. The hamon is a ko-notare mixed with gunome whose wide, bright and clear nioiguchi is quite ko-nie-loaden and shows some kinsuji. The bôshi tends to ichimai what is typical for Gô Yoshihiro. At Komaki and Nagakute, the 35.000 men army of the Tokugawa-Oda alliance faced a twice as strong army of Hideyoshi. When Hideyoshi learned on the ninth day of the fourth month Tenshô twelve (1584) that a part of his army had lost the Battle of Hakusanmori (白山林の戦い), he ordered 20.000 of his men to the close river of Ryûsenji (竜泉寺). Honda Tadakatsu faced him there with only 500 warriors and he was so brave as stopping his horse inmidst the river, only about 500 metres in front of Hideyoshi, to let it calmly drink. His aim was to delay Hideyoshi´s attack on his lord Ieyasu and succeeded with this daring manoeuvre. 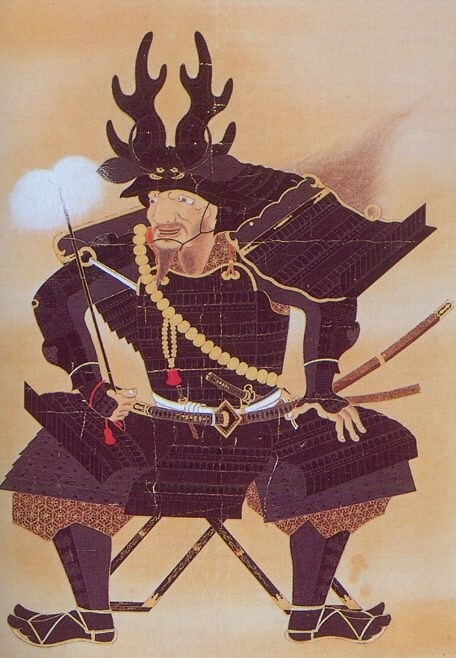 At that time, Tadakatsu wore his famous helmet with the deer antlers and the spear Tonbôgiri with a 6 m long shaft. Incidentally, he had it later shortened to 90 cm when he gew older. The nickname goes back to the story that once a dragonfly (tonbô, 蜻蛉) tried to land on the blade of the spear but was cut in half. The spear itself is a work of the same Masazane (正真) who made the aforementioned Inoshishigiri. The blade has a nagasa of 43,7 cm and a nakago length of 55,6 cm. The hi shows a relief of a bonji and a sankozuka-ken. Yasumasa was born in Tenbun 17 (天文, 1548) as second son of Sakakibara Nagamasa (榊原長政) in the Ueno district (上野郷) of Mikawa province. He came into the service of Ieyasu quite early, namely as one of his pages. Later and for his outstanding achievements in the crushing of the Ikkô-Ikki rebels (一向一揆) of Mikawa province, Ieyasu granted him his character for „yasu“. Before he was just called „Koheita“ (小平太). Yasumasa too participated successfully in the battles of Anegawa, Mikatagahara, Nagashino, and Komaki and Nagakute. 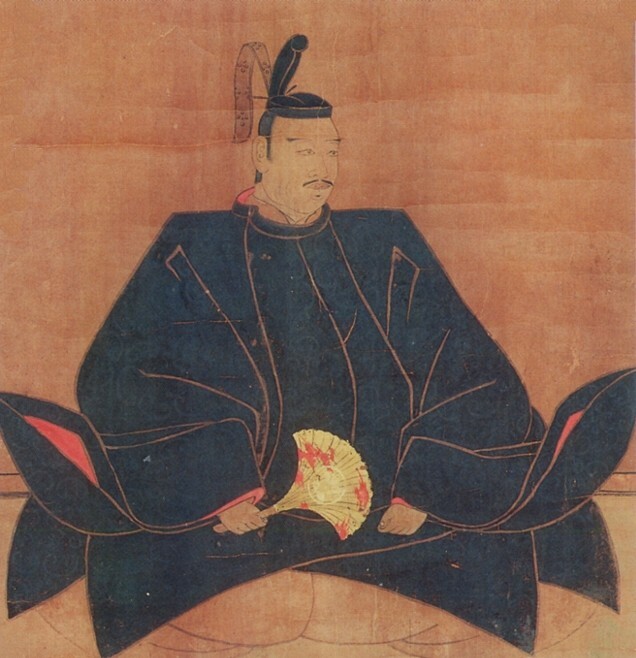 He criticized Hideyoshi´s quasi annexation of the Oda clan after Nobunaga´s death in 1584 whereupon Hideyoshi placed a bounty on his head in the height of 100.000 koku. In Tenshô 18 (天正, 1590), Yasumasa leaded Ieyasu´s vanguard at the siege of Odawara Castle (小田原征伐) and when his lord was transferred to the Kantô region in the very same year, Yasumasa was made lord of Tatebayashi Castle (館林城) in Kôzuke province. He restructured the surrounding land and turned it into the Tatebayashi fief of the same name which had later an income of 100.000 koku and remained in the possession of the Sakakibara family even after Sekigahara. Yasumasa also died there, namely on the 14th day of the fifth month Keichô eleven (慶長, 1606) at the age of 59. There is the legend that Ieyasu showed mercy with Ishida Mitsunari (石田三成, 1559-1600) after winning Sekigahara and that he hid him at Sakakibara Yasumasa where he got old and died a natural death. For this great favour an maintaining strict silence, he presented Yasumasa with a sunnobi-tantô of Sôshû Sadamune. However, the more common transmission says that Mitsunari gave the sword in question as a memento to his friend Tanaka Yoshimasa (田中吉政, 1548-1609) who namely found and arrested him when he hid in Ômi province after his defeat at Sekigahara. But it remains unclear how the sword came in this version from the Tanaka into the possession of the Sakakibara family. 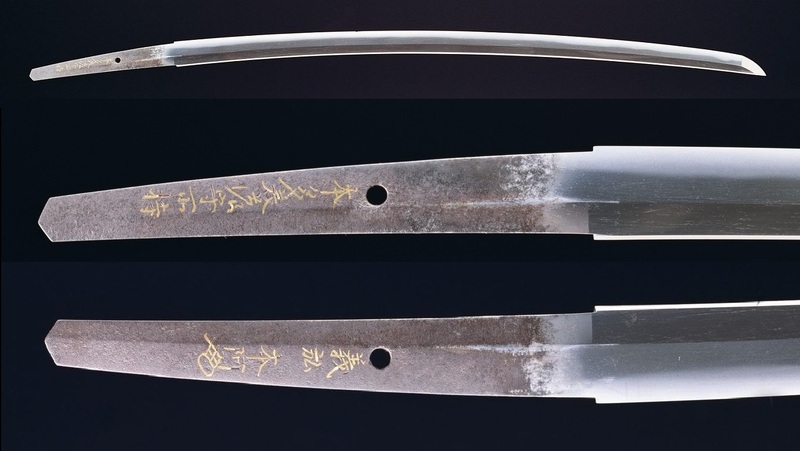 Anyway, the blade has a nagasa of 31,2 cm, a sori of 0,5 cm, is in hira-zukuri and has a mitsu-mune. The kitae is a standing-out itame with plentiful of ji-nie and quite prominent chikei. The hamon is a Sadamune-typical ko-notare in ko-nie-deki with a wide nioiguchi and plentiful of kinsuji. The bôshi is in midare-komi with hakikake and a rather long running-back kaeri. The omote side shows a bonji, a rendai, a kuwagatga and a suken, and the ura side a bonji and gomabashi. The tang is ubu, mumei, has a funagata and a kengyô-jiri. The koshirae is a work of the early Edo period. A transmission says that the favourite sword of Yasumasa was a 73,3 cm long tachi of Rai Kuniyuki which he got as a present from Ieyasu for his military achievements. One theory assumes now that this was the meibutsu „Fudô-Kuniyuki“ (不動国行) which I have introduced recently in this article. As the Fudô-Kuniyuki was since the Battle of Komaki and Nagakute a heirloom of the Tokugawa family, the only way the mentioned theory could work is that Ieyasu had presented the sword to Yasumasa but the latter, or the Sakakibara family, gave it later as a return gift to the Tokugawa. Records show us that Ieyasu presented a katana of Bizen Motoshige to Yasumasa on the 25th day of the eleventh month Keichô eight (1603) together with two yari of a not further described Kunitsuna (国綱) and a raise of his salary by 5.000 koku. Unfortunately, the blade suffered a fire damage at an earthquake in Ansei two (安政, 1855) but was successfully rehardened. According to extant records, Yasumasa received this yari in Tenshô twelve (1584) on the occassion of the Battle of Komaki and Nagakute. It is a hira-sankaku sasaho-yari with a nagasa of 19,1 cm. It is said that the shaft was originally 1,8 m long. The blade is signed „Morinaga“ (守長) and is still in the possession of the Sakakibara family. Naomasa was born on the 19th day of the second month Eiroku four (永禄, 1561) as oldest son of the Imadegawa-retainer Ii Naochika (井伊直親) in Iinoya (井伊谷) in Tôtômi province. That means he was the only one of the four Tokugawa-shitennô who came not from Mikawa. When his father was executed because of a false accusation in Eiroku five (1562), the situation of the Ii family was unclear until Naomasa became Ieyasu´s page in Tenshô three (天正, 1575) and the decision was made that the Ii lineage should be continued. Naomasa showed a great political talent when he was acting as messenger at the peace negotiations of the Tokugawa with the (北条) after the Tenshô-Jingo Incident (天正壬午の乱) in Tenshô ten (1582). After Ieyasu annexed the former Takeda lands in Shinano and Kai, he gave Naomasa the command over the elite troops „Ii no Akazonae“ (井伊の赤備え, about „the Red Ii“) or also called „Ii no Akaoni (井伊の赤鬼, „the Red Ii Devils“), which were as the name suggests equipped with red-lacquered armours. Two years later and at the Battle of Komaki and Nagakute, Naomasa was able to make himself a name as leader of this troop and in Tenshô 18 (1590), he leaded his men at the siege of Odawara Castle in an unequalled night attack where they were able to enter the castle grounds. 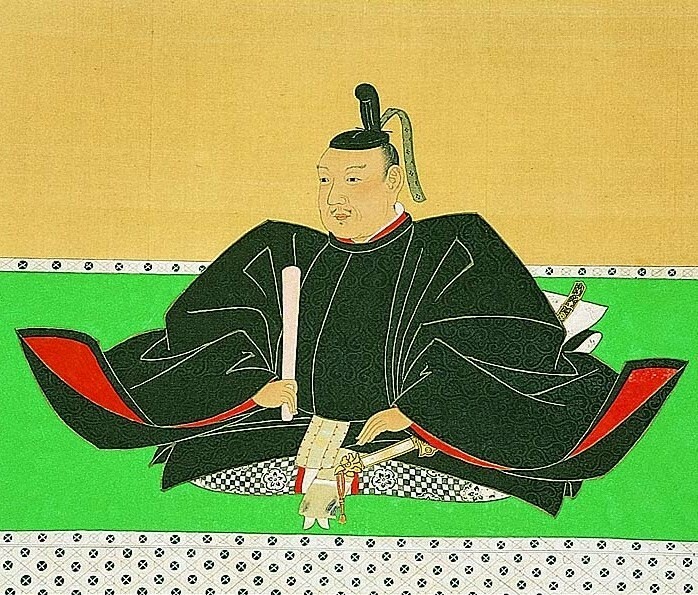 When Ieyasu was transferred to the Kantô region, Naomasa became castellan of Minowa (箕輪城) in Kôzuke province and was thus in the possession of the lands with the highest income (120.000 koku) amongst all Tokugawa retainers. At Sekigahara he was hit by a bullet in his right arm and fell of his horse but insisted to participate until the battle was over. For his service and achivements, he received the Sawayama fief (佐和山藩) of Ômi province worth 180.000 koku which was before ruled by Ishida Mitsunari. But he died shortly later, namely on the first day of the second month Keichô seven (1602). Naomasa got this tachi from Ieyasu in Tenshô 18 (1590) for his military achievements at the Siege of Odawara. Later his descandants offered the sword to the Ii-jinja (井伊神社) in Ômi province which was erected to honour Naomasa, but the shrine returned it to the Ii family after World War II. It became kokuhô in 1922 but received later „just“ the status jûyô-bunkazai after the re-submittal in the course of the new system. 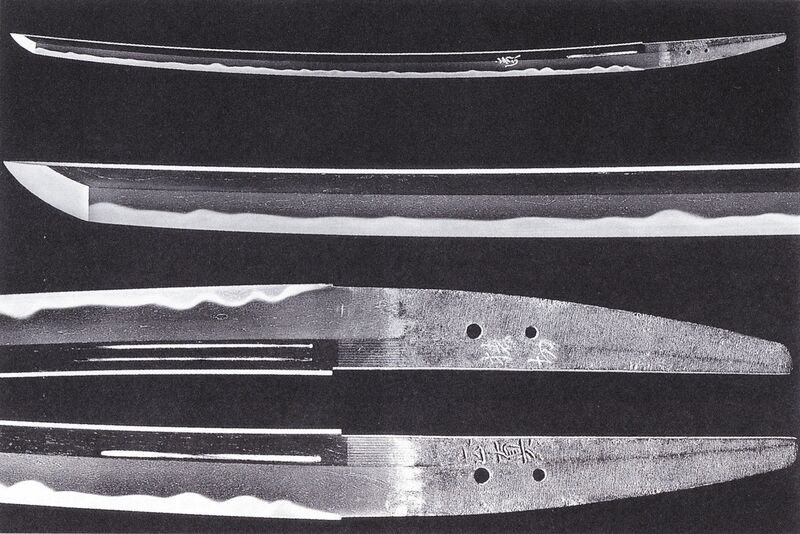 The blade has a nagasa of 70,0 cm, is in shinogi-zukuri, has an iori-mune, is rather slender and has a deep koshizori. The kitae is a very densely forged ko-itame with ji-nie and a midare-utsuri. The hamon is a suguha with ko-ashi and a relative tight nioiguchi, and the bôshi is sugu too with a roundish kaeri. The tang is ubu and bears quite high and towards the nakago-mune a rather small niji-mei. The blade is attributed to the 2nd generation Kunimune, i.e. to the son of Saburô Kunimune (三郎国宗). This blade is also ubu and signed „Kunimune“ but is not a work of Bizen-Saburô but of Hôki Kunimune. It has a nagasa of 79,0 cm, a sori of 2,9 cm, a deep koshizori and funbari. The kitae is a standing-out itame with ji-nie and chikei and the hamon is a quite ko-nie-loaden suguha-chô mixed with ko-midare, kinsuji and sunagashi. The nioiguchi is subdued and the bôshi is midare-komi with a ko-maru-kaeri.